I'm looking forward to going into the Tight Lines Studio "Bothy" to chat over my recent Cayman Islands trip with presenter Keith Arthur. We will be watching footage from the trip, where I caught bonefish, tarpon and a host of other species on the fly rod. Little Cayman really is a wonderful location and a tropical island paradise - the fishing is great too! We will also be discussing thoughts on the coming trout fly fishing season and talking about the methods most likely to bring success. The show goes out on Sky Sports 3 at 6:00pm this Friday, 9th March 2012. My trip to Tasmania was truly awesome. I have always felt, from my previous visits, that Tasmania had the best stillwater trout fly fishing in the World and my feelings have not changed one bit. In fact, having driven all over the island on my travels, I now know that there are a multitude of lakes and rivers to fish - not just the better known waters of the Highlands region. The Gum Beetles didnt put in much of a show during the sunny afternoons, but as soon as the cloud covered the sun, mayflies (known there as Duns) hatched in their thousands. Early morning and late evenings gave us opportunities for tailing fish in the margins, while the sunnier days helped us to "polaroid" fish in open water. These are techniques that we simply do not encounter back home. We even had some time for a sea fishing trip out from Port Arthur aboard Steve Gilbert's boat Moonshine. We were after Tuna, but due to calm seas, they were elusive. We did get 6 hits and 2 Albacore to the boat, plus a heap of Gurnard, flathead, perch and striped trumpeter to baits fished 300 feet below the boat! But it was the rivers that were the real eye openers. Huge wild trout from tiny streams and creeks - wild rainbows and browns from tumbling rivers as clear as the river Test. I caught my biggest ever wild brownie from a river no wider than a minor road. 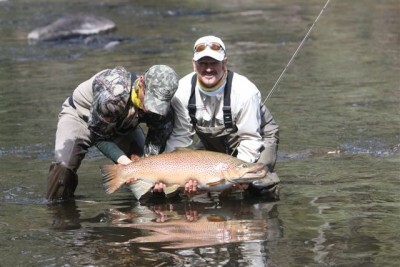 Keep your eyes out for it in Trout Fisherman magazine as they have the exclusive in pics and words next month. The Lexus Web Site is now fully operational and updated for the 2012 season. Download an Entry Form for Individuals or Teams from the site and follow the progress of each and every match as it unfolds throughout the year. The first Individual Heat is at Llyn Llandegfedd in South Wales this coming Sunday, 11th March 2012. Llandeg has been fishing it's head off since opening day and loads of overwintered rainbows are being caught. It's not too late to enter this Heat, just email lexus@johnhorsey.co.uk to reserve your place.